To mark, point, emphasise, attach, identify - all that is not a problem for the little flag magnets. The flag needle can be easily removed from the magnet base and used as a pin. 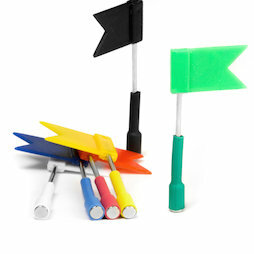 These magnetic flags have therefore countless uses on magnetic boards, whiteboards or (without the magnetic base) on a general pin board or map. Despite the small size, they can hold 2 -3 A4 sheets even on smooth surfaces, thanks to the strong magnet.